The NEXTFLEX® Rapid Directional RNA-Seq Kit provides an easy and flexible solution for generating single read, paired-end and multiplexed stranded libraries from mRNA or rRNA depleted total RNA. This kit can be used to obtain “stranded” information which identifies the specific DNA strands a given RNA transcript was derived from with >99% strand specificity. This stranded information improves transcript annotation and improves read alignment, reducing per sample sequencing costs. 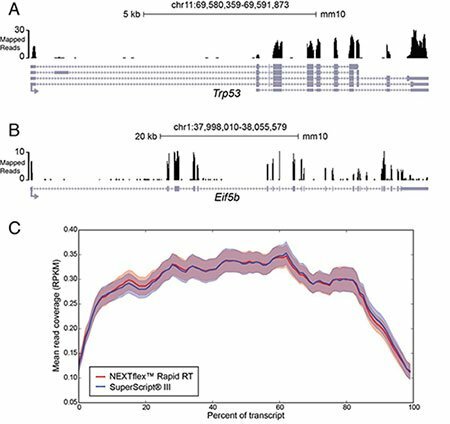 dUTP-based strand orientation also enables the detection of antisense expression regulatory relationships and allows for the discovery of novel ncRNA. To simplify your mRNA sequencing, PerkinElmer now offers affordable bundles containing the NEXTFLEX® Rapid Directional RNA-Seq library prep reagents, NEXTFLEX® RNA-Seq Barcodes and NEXTFLEX® Poly(A) Beads. There are two different versions of this kit. They each contain the 48 rxn NEXTFLEX® Rapid Directional RNA-Seq Kit, NEXTFLEX® Poly(A) Beads (48 rxns) and 24 unique NEXTFLEX® RNA-Seq Barcodes (in aliquots of 2 reactions each). The whitepaper, Improved Rapid Stranded RNA-Seq Offers Higher Library Yields and Better Mapped Reads, illustrates a detailed comparison of the NEXTFLEX® Rapid Directional RNA-Seq Kit with a competitor’s fast directional library prep kit. The NEXTFLEX® Rapid Directional RNA-Seq Kit excelled at rRNA removal, library yield and overall quality metrics. Our whitepaper, Constructing High Quality RNA-Seq Libraries from Limited Amounts of Total RNA, illustrates the robustness of the NEXTFLEX® Rapid Directional RNA-Seq Kit used along with NEXTFLEX® Poly(A) Beads for mRNA isolation and library preparation from input as low as 10 ng of total RNA. Optimized automation protocols for stranded RNA library prep using the NEXTFLEX® Rapid Directional RNA-Seq Library Preparation Kits are available for the Sciclone® NGS and NGSx Workstations. Download the Sciclone NGS and NGSx Workstation Automation Guides for the NEXTFLEX® Rapid Directional RNA-Seq Kit. The NEXTFLEX® Rapid Directional RNA-Seq Library Prep Kit was designed to be used in conjunction with the NEXTFLEX® RNA-Seq Barcodes or NEXTFLEX-96™ RNA-Seq Barcodes for multiplexing. These single index barcodes are available in sets of 6, 12, 24, 48 and 96 barcodes. The NEXTFLEX® Poly(A) Beads offer a convenient method, validated with the NEXTFLEX® Rapid Directional RNA-Seq Kit, for purification of pure, intact mRNA. RNA Sequencing (RNA-Seq) is a valuable tool for a broad range of clinical, environmental, and basic research. Producing high quality RNA-Seq libraries can be challenging for several reasons, including isolation of pure RNA, efficiently converting RNA to cDNA, and loss of material incurred during the series of enzymatic steps and cleanups required for library construction. Here we introduce PerkinElmer’s family of NEXTFLEX® Rapid RNA-Seq kits for Illumina® sequencing, all of which include the thermostable NEXTFLEX® Rapid Reverse Transcriptase enzyme. The NEXTFLEX® Rapid RNA-Seq Kits provide affordable and unique technology, some of the shortest RNA-Seq library preparation times of any kits on the market, include all enzymes required for library preparation, and produce the highest quality RNA-Seq library. The NEXTFLEX® Rapid RNA-Seq Kits allow the end user to complete library construction in less than 1 day. In contrast, the previous generation of NEXTFLEX® RNA-Seq Kits, as well as the current Illumina® TruSeq® RNA-Seq Kits, require over 7 hours for completion (Table 1). By combining second strand synthesis and end repair into the same reaction, the need for a separate end repair step and cleanup is eliminated. This improvement is time efficient and reduces loss of material during cleanup. Table 1. Comparison of RNA-Seq library preparation kit protocols and time to completion. Note that times include bead cleanups and account for time required from RNA fragmentation to the final bead cleanup after PCR. A critical step in RNA-Seq library construction is the conversion of RNA to cDNA. All NEXTFLEX® Rapid RNA-Seq Kits include NEXTFLEX® Rapid Reverse Transcriptase (RT) enzyme, in contrast to our previous RNA-Seq kits as well as to the Illumina® TruSeq® kit (Table 1). The NEXTFLEX® Rapid RT is a thermostable, RNaseH minus enzyme that functions optimally at 50˚ C, a higher temperature than standard Moloney-Murine Leukemia Virus (M-MLV) reverse transcriptases, which function at 42˚ C. This elevated temperature allows for reduced secondary structure in RNA templates and therefore increased efficiency of first strand synthesis. To examine the efficacy of NEXTFLEX® Rapid RT in library construction, we compared library yields using cDNA produced by different enzymes. The same pool of Poly (A)+ selected mRNA isolated from murine Ag8 cells was used in first strand synthesis with either NEXTFLEX® Rapid RT or SuperScript® III (Figure 1). Higher library yields were obtained using the NEXTFLEX® Rapid RT coupled with the NEXTFLEX® Rapid RNA-Seq Kit. Similar results were obtained using the NEXTFLEX® Rapid Directional and NEXTFLEX® Rapid Directional qRNA-Seq™ Kits. 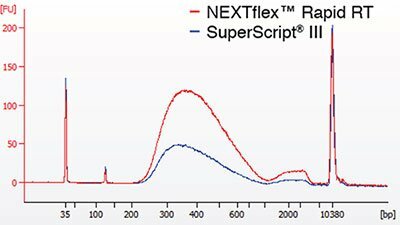 These results demonstrate improved library yields as a result of optimized first strand synthesis using NEXTFLEX® Rapid RT. Figure 1. Improved library yield using NEXTFLEX® Rapid RT. High Sensitivity DNA Bioanalyzer traces of RNA-Seq libraries constructed with NEXTFLEX® Rapid RNA-Seq Kits. Libraries were constructed using 10 ng of fragmented, Poly (A)+ mRNA converted to cDNA using either NEXTFLEX® Rapid RT (blue) or SuperScript® III (red). Further analysis of NEXTFLEX® Rapid RNA-Seq library quality was carried out using Illumina® Sequencing, as library yield is only one metric of library quality. Libraries were prepared with the NEXTFLEX® Rapid RNA-Seq Kit using 10 ng aliquots of a single murine Ag8 cell Poly (A)+ RNA sample, so as to disentangle biological variation from technical variation. Libraries were sequenced on a HiSeq® 2500 using a 67 bp single end RAPID run. Resulting reads were trimmed based on a quality score moving window using sickle and mapped to the UCSC mm10 assembly using TopHat 2.0.10. We obtained a total of 31,949,336 reads for Rapid RT libraries and 31,720,922 for Superscript III libraries (Table 2). For transcript representation purposes, only reads mapping to exons, specifically all annotated 5’ UTRs, coding sequences, and 3’ UTRs, were further considered. The number of total reads as well as unique reads mapping to exons were similar between the two enzymes; however, a greater number of transcripts, 12,418 vs. 12,129, were represented in the NEXTflex Rapid RT libraries vs. SuperScript III libraries, respectively. Table 2. Read counts in NEXTFLEX® Rapid RNA-Seq libraries and unique reads after mapping to exons. A further analysis of mapped reads was performed. Read quality before and after mapping was visualized using FastQC and GC content as a function of reads examined (Figure 2). Read quality is excellent in the total library and is slightly higher in the remaining set of trimmed, mapped reads, which is expected given a quality-aware trimming step was carried out. Furthermore, GC content is very similar to the theoretical distribution, indicating accuracy in transcript representation. 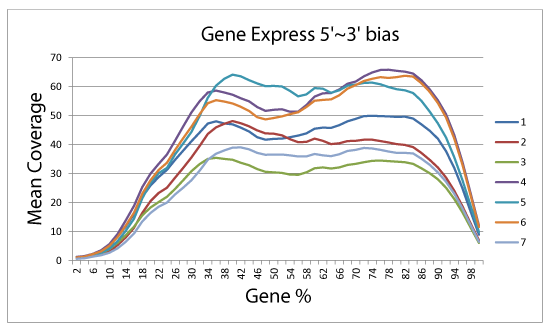 Visual inspection of several genes demonstrates read coverage across all exons (Figure 3A and B). Furthermore, a metagene analysis of read coverage across all genes divided into 100 bin segments, demonstrates even read coverage across the 5’-, gene body, and 3’-ends of transcripts (Figure 3C). Figure 2. Metrics of NEXTFLEX® Rapid RNA-Seq data determined by FastQC. Quality score plots for (top) and mean GC content (bottom) for (A) all reads or (B) reads mapping to exons. 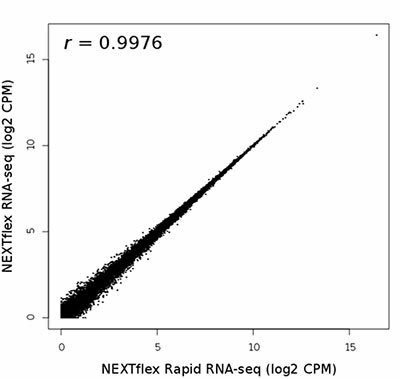 Plots shown correspond to NEXTFLEX® Rapid RNA-Seq libraries constructed using NEXTFLEX® Rapid RT. Figure 3. Read coverage across gene bodies. Mapped reads at the (A) Trp53 and (B) Eif5b loci scaled to read density as indicated. (C) Metagene plot of read density across all annotated loci. All gene bodies and mapped read densities are scaled to 100 bin segments; mean read density is shown in reads per kilobase per million mapped reads (RPKM; solid line) +/- standard error across replicates (faded bands). Shown is read signal corresponding to libraries made with either NEXTFLEX® Rapid RT (red) or SuperScript III (blue). Finally, we examined library consistency across protocols. 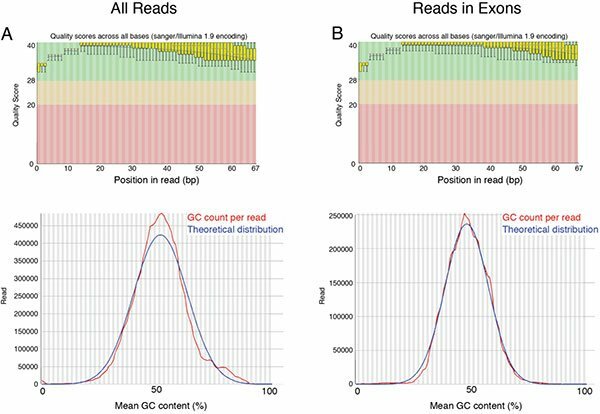 We compared RNA-Seq read counts in exons from libraries constructed using the NEXTFLEX® Rapid RNA-Seq Kit to longer traditional protocols. Indeed, libraries constructed using the two methods were highly similar (r = 0.9976; Figure 4). These data demonstrate that the NEXTFLEX® Rapid RNA-Seq protocol provides significantly faster library construction with enhanced reverse transcriptase performance. Figure 4. Correlation between Rapid and Standard RNA-Seq data. Pearson’s correlation between the average log2 of normalized counts per million (CPM) of all genes across all replicates of Rapid RNA-Seq vs. Standard RNA-Seq, r = 0.9976. The present study demonstrates the utility of the NEXTFLEX® Rapid RNA-Seq Kits as a method to improve speed of library preparation without any compromise in library quality. All NEXTFLEX® Rapid RNA-Seq Kits include NEXTFLEX® Rapid RT, a high performance thermostable enzyme, thus providing all components required for library construction within a single kit. NEXTFLEX® Rapid RNA-Seq Kits produced high-quality sequencing data with improved transcript representation. In addition, the increased library yield using NEXTFLEX® Rapid RT is an important improvement for users with low-input amounts. For researchers wishing to multiplex libraries, PerkinElmer continues to offer our full range of up to 96 NEXTFLEX® RNA-Seq adapter barcodes. The NEXTFLEX® Rapid RNA-Seq, Rapid Directional RNA-Seq, and Rapid Directional qRNA-Seq™ Kits provide a streamlined workflow for users to create high-quality RNA-Seq libraries with less hands-on time. Normalized coverage by position. For each library, the average coverage is shown at each relative position along the transcripts’ length. Beyaz, S. et al. (2016) High-fat diet enhances stemness and tumorigenicity of intestinal progenitors. Nature. 531, 53–58. doi:10.1038/nature17173. Blance, S., et al. (2016) Stem cell function and stress response are controlled by protein synthesis. Stem cell function and stress response are controlled by protein synthesis. Nature, 534, 335–340. doi:10.1038/nature18282. Bonizzoni, M., et al. (2013) Probing functional polymorphisms in the dengue vector, Aedes aegypti. BMC Genomics. 14:739 http://www.biomedcentral.com/1471-2164/14/739. Carnes, M. U., et al. (2015) The Genomic Basis of Postponed Senescence in Drosophila melanogaster. PLoS ONE. doi: 10.1371/journal.pone.0138569. Denzler, R., Agarwal V., Stefano J., Bartel DP. and Stoffel, M. (2014) Assessing the ceRNA hypothesis with quantitative measurements of miRNA and target abundance. Mol. Cell. 54:4 pp 766-76. Dharshinia, S., et al. (2016) De novo sequencing and transcriptome analysis of a low temperature tolerant Saccharum spontaneum clone IND 00-1037. J of Biotechnology. doi: 10.1016/j.jbiotec.2016.05.036. Dobáková, E., Flegontov, P., Skalický, T. and Lukeš, J. (2015) Unexpectedly Streamlined Mitochondrial Genome of the Euglenozoan Euglena gracilis. Genome Biol Evol. 7. 3358-3367. doi:10.1093/gbe/evv229. Fang, W. and Bartel, D. P. (2015) The Menu of Features that Define Primary MicroRNAs and Enable De Novo Design of MicroRNA Genes. Molecular Cell. 60:1. p131–145. doi: 10.1016/j.molcel.2015.08.015. Guérin, F., Isnard, C., Cattoir, V. and Giard, J. C. (2015) Complex Regulation Pathways of AmpC-Mediated β-Lactam Resistance in Enterobacter cloacae Complex. Antimicrob. Agents Chemother., 59: 7753 – 7761. doi: 10.1128/AAC.01729-15. Jones, B. M., Wcislo, W. T. and Robinson, G. E. (2015) Developmental Transcriptome for a Facultatively Eusocial Bee, Megalopta genalis. g3, Oct 2015; 5: 2127 – 2135. doi: g3.115.021261v1. Lamanna, F., et al. (2015) Cross-tissue and cross-species analysis of gene expression in skeletal muscle and electric organ of African weakly-electric fish (Teleostei; Mormyridae). BMC Genomics. 16:668 . doi:10.1186/s12864-015-1858-9. Lin, M.-H., Jones, D. F. and Fleming, R. (2015) Transcriptomic analysis of degraded forensic body fluids, Forensic Science International: Genetics, Volume 17. 35-42. dio: 10.1016/j.fsigen.2015.03.005. McNeill, M. S., Kapheim, K. M., Brockmann, A., McGill, T. A. W., Robinson, G. E. (2015) Brain regions and molecular pathways responding to food reward type and value in honey bees. Genes, Brain and Behavior. doi: 10.1111/gbb.12275. Mullenders, J., et al. (2015) Cohesin loss alters adult hematopoietic stem cell homeostasis, leading to myeloproliferative neoplasms. J. Exp. Med. 2015; 212:1833-1850. doi: 10.1084/jem.20151323. Nam, J., Rissland, O.S., Koppstein, D. et al. (2014) Global Analyses of the Effect of Different Cellular Contexts on MicroRNA Targeting. Molecular Cell. http://dx.doi.org/10.1016/j.molcel.2014.02.013. Pham, K. T. M., et al. (2015) MoSET1 (Histone H3K4 Methyltransferase in Magnaporthe oryzae) Regulates Global Gene Expression during Infection-Related Morphogenesis. PLOS Genetics. doi: 10.1371/journal.pgen.1005385. Rittschofa, C. C., et al. (2014) Neuromolecular responses to social challenge: Common mechanisms across mouse, stickleback fish, and honey bee. PNAS. doi: 10.1073/pnas.1420369111. Rossetto CC, Tarrant-Elorza M, Pari GS (2013) Cis and Trans Acting Factors Involved in Human Cytomegalovirus Experimental and Natural Latent Infection of CD14 (+) Monocytes and CD34 (+) Cells. PLoS Pathog 9(5): e1003366. doi:10.1371/journal.ppat.1003366. Rube, H. T., et al. (2016) Sequence features accurately predict genome-wide MeCP2 binding in vivo. Nature Communications. 7:11025. doi:10.1038/ncomms11025. Solovchenko, A., et al. (2016) Nitrogen availability modulates CO2 tolerance in a symbiotic chlorophyte, Algal Research, 16, 177-188. doi: 10.1016/j.algal.2016.03.002. Tarvin, R. D., Santos, J. C., O’Connell, L. A., Zakon, H. H. and Cannatella, D. C. (2016) Convergent Substitutions in a Sodium Channel Suggest Multiple Origins of Toxin Resistance in Poison Frogs. Mol Biol Evol. 33:4. 1068-1081. doi: 10.1093/molbev/msv350. Van Laar, T, A., Chen, T, You, T., and Leung, K. P. (2015) Sublethal Concentrations of Carbapenems Alter Cell Morphology and Genomic Expression of Klebsiella pneumoniae Biofilms. Antimicrobial Agents and Chemotherapy. doi: 10.1128/AAC.04581-14. Wheeler, M. M. and Robinson G. E. (2014) Diet-dependent gene expression in honey bees: honey vs. sucrose or high fructose corn syrup. Scientific Reports. 4: 5726. doi:10.1038/srep05726. Zhang, Y. et al. (2015) Genome-, Transcriptome- and Proteome-Wide Analyses of the Gliadin Gene Families in Triticum urartu. PLOS One. doi: 10.1371/journal.pone.0131559. The NEXTFLEX® Rapid Directional RNA Library Prep Kit contains enough material to prepare 8 or 48 RNA samples for Illumina® sequencing. The shelf life of all reagents is 12 months when stored properly. All components can safely be stored at -20°C.